Purpose of Wildlife Management Area: Conservation of a significant wetland area which is an important component of the Pacific Flyway. Adjacent to the Columbia River extending 180 km from Canal Flats to the head of the Mica Reservoir just north of Donald. The Columbia Wetlands are a vital component of the Pacific Flyway, a waterfowl migration route which stretches from nesting areas on the Arctic Ocean to wintering grounds in South America. The wetlands provide nesting, feeding and resting sites which are used intensively by ducks, geese, Tundra and Trumpeter Swan, Great Blue Heron, Osprey, Merganser, Loon, Grebe, Kingfisher and Bald Eagle. White-tailed Deer, Moose, Elk and other ungulates find vital habitat here, especially in winter. Cougar, Wolf, Coyote, Black Bear, Grizzly Bear, Beaver, Muskrat, Pileated Woodpecker and many small mammals and songbirds use the area, along with a number of imperilled and critically-imperilled species. These wetlands are critical for maintaining regional populations of several species of amphibians and reptiles, including the Leopard Frog, Painted Turtle and Rubber Boa. In addition, a variety of sports and other fish species occur, including Westslope Cutthroat Trout, Rainbow Trout, Bull Trout, Mountain Whitefish, Largemouth Bass, Burbot, Pumpkinseed, Peamouth Chub, Northern Squawfish, Longnose Sucker and Redside Shiner. 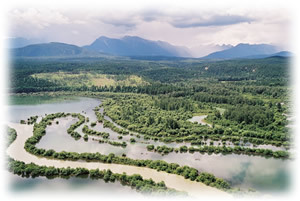 The Columbia Wetlands are located in the Rocky Mountain Trench, a long, wide valley between the Rocky Mountains to the east and the Purcell Mountains to the west, within the Interior Douglas-fir and the Interior Cedar-Hemlock biogeoclimatic zones. The Trench is 3 to 5 kilometres wide with sloping benches on either side of the valley floor. The Columbia River floodplain is very flat and varies from 1 to 2 kilometres in width. The area consists primarily of riparian and wetland habitat along the floodplain of the Columbia River, including lakes, marshes, ponds, swamps, and flowing and standing water. Vegetation on levees and in some slightly drier benchland areas includes trees such as Hybrid White Spruce, Black Cottonwood, and Aspen, along with grasslands and shrubs such as Willow, Alder, Rose and Red-osier Dogwood. On the flood-plain itself there is a mosaic of emergent species, including Hardstem Bulrush, Cattail, Horsetail and sedges and a variety of submergents and other aquatic plants such as Bladderwort, Pondweed, Yellow Water Lily and Arrowhead. The Columbia wetlands offer opportunities for a range of recreational activities including wildlife viewing, hunting, fishing, interpretive float trips, trapping, photography and nature appreciation. Several traplines exist and limited guided hunting occurs in the wetlands late in the season. The Columbia River system has a long history of occupation by indigenous peoples and there are numerous archaeological and traditional use sites of importance to First Nations in the wetlands.